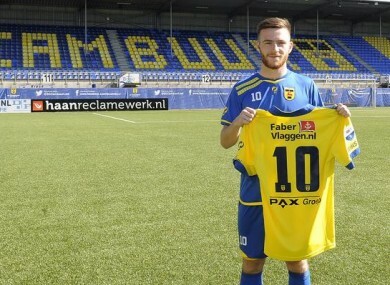 Jack Byrne poses with his new jersey. HAVING SIGNED A new contract yesterday, promising young Irish starlet Jack Byrne has already made his next move. Byrne is going out on loan to Dutch top-flight side Cambuur, who finished 12th in last season’s Eredivisie. The 19-year-old midfielder will be hoping to impress with the prospect of regular first-team football in Holland likely. He has previously earned high praise from City EDS coach Patrick Vieira and will be hoping a stint abroad will push him closer to a coveted spot in the first-team squad at Eastlands. Email “After signing a new contract yesterday, Ireland's Jack Byrne is on the move*”. Feedback on “After signing a new contract yesterday, Ireland's Jack Byrne is on the move*”.